Low pressure sodium lamps provide the highest luminous efficacy of all lamps in general use. 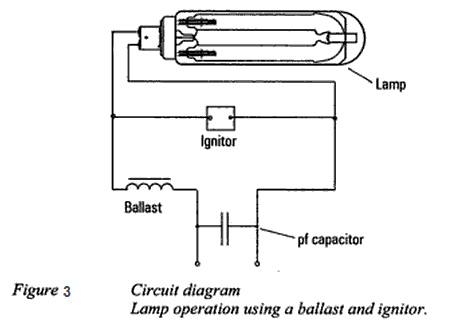 The construction of the lamp is shown in Figure 1. 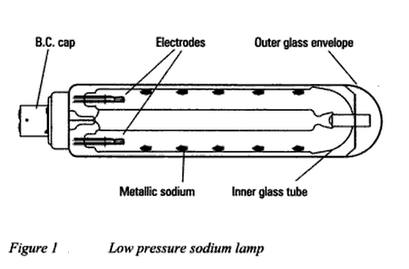 The inner U shaped glass tube is filled with a neon and argon mixture at low pressure. A small quantity of metallic sodium is also added to the mixture. The outer glass envelope creates a vacuum to keep the inner discharge tube at the optimum operating temperature so that sodium particles can vaporize. 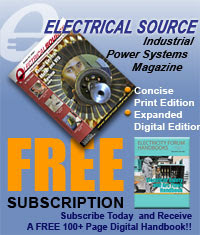 A high voltage is supplied by the control gear to start the lamp. The initial discharge is in the neon and argon gas (glows red). Heat from the discharge gradually vaporizes the metallic sodium, causing the discharge to change from red to yellow. 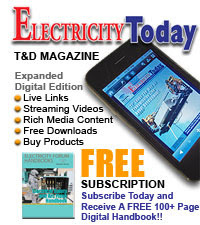 A significant reduction in lamp voltage occurs when complete vaporization of sodium takes place. 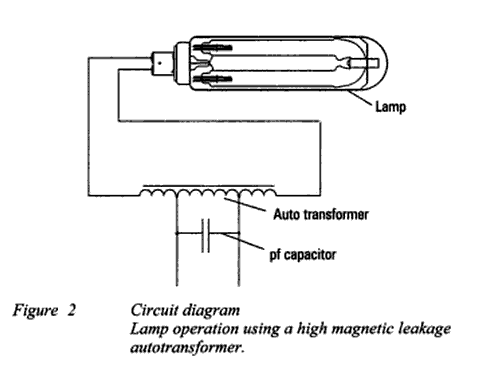 Lamp operation is achieved by using a high magnetic leakage autotransformer or a ballast and ignitor. Power factor correction capacitors are used in both circuits (Figure 2 and 3).